The Rivanna Stormwater Education Partnership wrote five PSAs on stormwater topics for broadcast on local radio stations. They were recorded in November 2005 at the Charlottesville Radio Group studios for broadcast on WINA, Z95.1 and 3WV 97.5. It's raining cats and dogs – where will they all end up? Did you ever wonder where all that rain goes after falling on the street? Well, most of it goes down a storm drain. Any pollution it carries ends up in the nearest creek and eventually reaches the Chesapeake Bay. 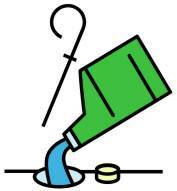 The same goes for anything else that goes down a storm drain, such as used motor oil or paint. So remember, recycle used motor oil, paints, solvents and anything else that can harm the water we depend on. Don't send the environment down the drain. To learn more, visit www.rivanna-stormwater.org. Keep your lawn green and the water blue. Using too much fertilizer or other lawn care product can cause water pollution. The same rain that helps turn your garden green also carries excess fertilizers, pesticides, and other pollutants into the nearest creek, turning the water green, or worse. Much of it makes its way downstream to the Chesapeake Bay. Have your soil tested to determine how much fertilizer you really need. 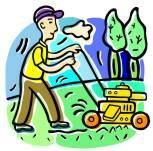 And use lawn care products as instructed on the product labels. Less is always more when it comes to water quality. Did you know 1 quart of motor oil can contaminate 250,000 gallons of water? Every year in the U.S., millions of gallons of used motor oil, chemicals, and other wastes are disposed of illegally – down a storm drain or in the trash. Unlike sewage, stormwater is not treated. Storm drains empty directly into local streams and eventually reach the Chesapeake Bay. 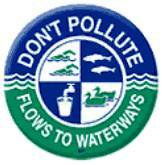 Please do your part to keep our waterways healthy. Recycle used motor oil at the Rivanna Solid Waste Authority’s Ivy location or return it to where you bought it. Think picking up your pet’s waste is unpleasant? How about swimming in it? Every time it rains, runoff from your lawn carries bacteria and other organisms from your pets’ waste into local streams – these streams eventually flow into the Chesapeake Bay. The runoff also carries an overload of nutrients which can cause harmful algae blooms in local reservoirs. Please dispose of pet waste properly by bagging it and throwing it away. Don’t leave it in your yard or on the sidewalk. Planning to wash your car this weekend? Ever wonder where all that water goes after it runs off your driveway? This water does not get treated and carries oil, soaps, and cleaners into storm drains; it flows directly into local streams and eventually reaches the Chesapeake Bay. To help prevent this, consider using biodegradable cleaning products, and wash your car on the lawn, instead of the driveway. 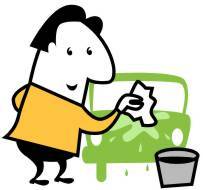 Even better, take your car to a carwash facility that recycles its wash water.